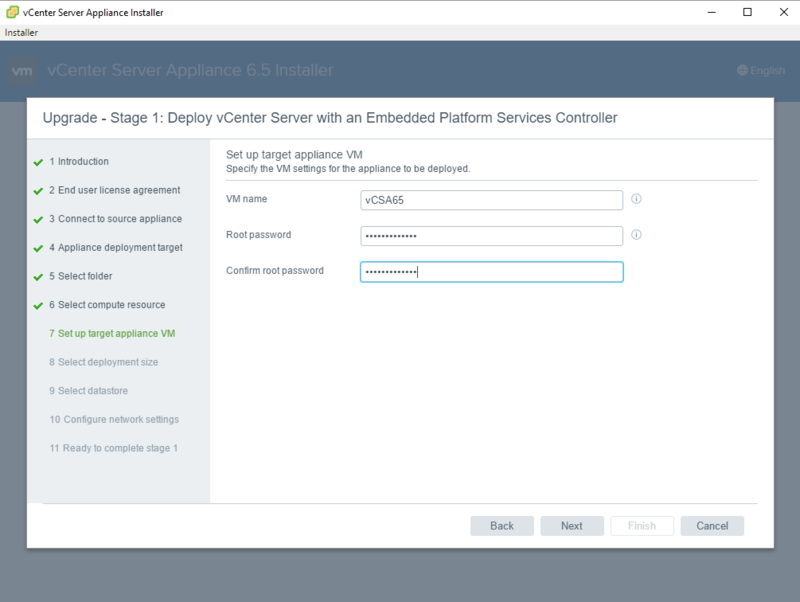 This post will be a guide on getting you from vCSA 6 to 6.5 with setting up vCSA HA at a later date. Hit next, accept the EULA, and fill out your environmental info. 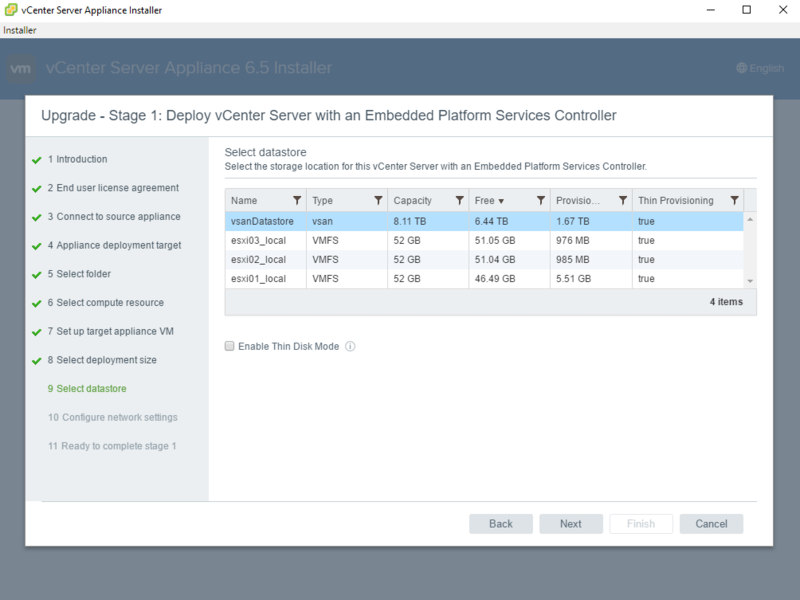 FQDN/IP of 6.0 vCSA, SSO details, and the ESXi host info that is currently housing your 6.0 vCSA. 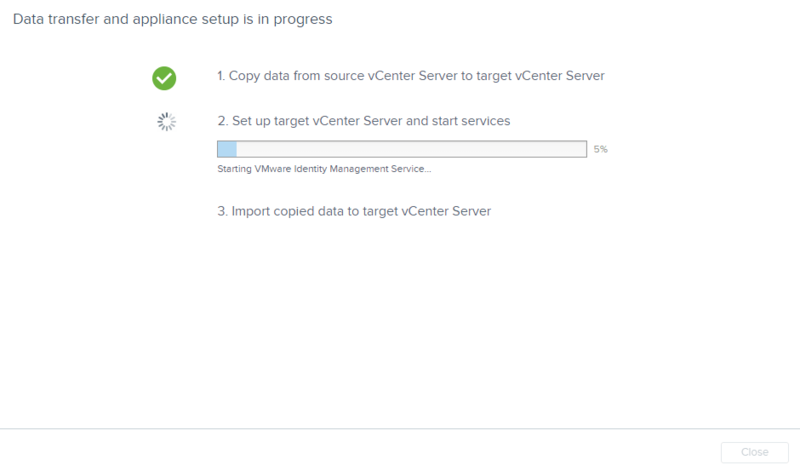 Now, if you are running VUM on a Windows server in your environment, you will see the following error: Unable to retrieve the migration assistant extension on source vCenter Server. 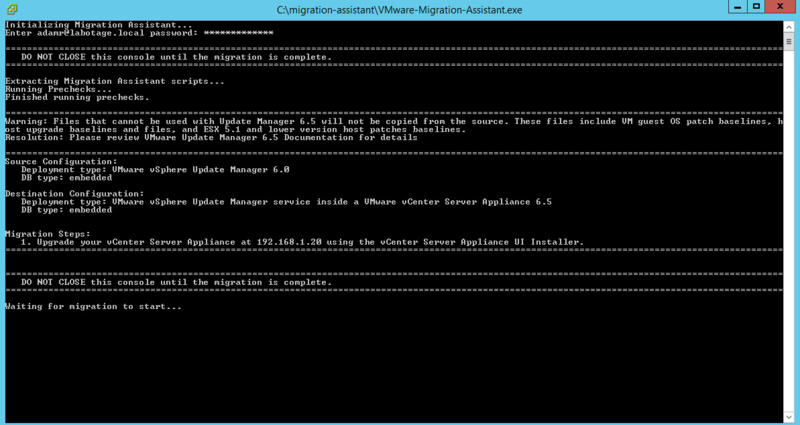 Make sure migration assistant is running on the VUM server. 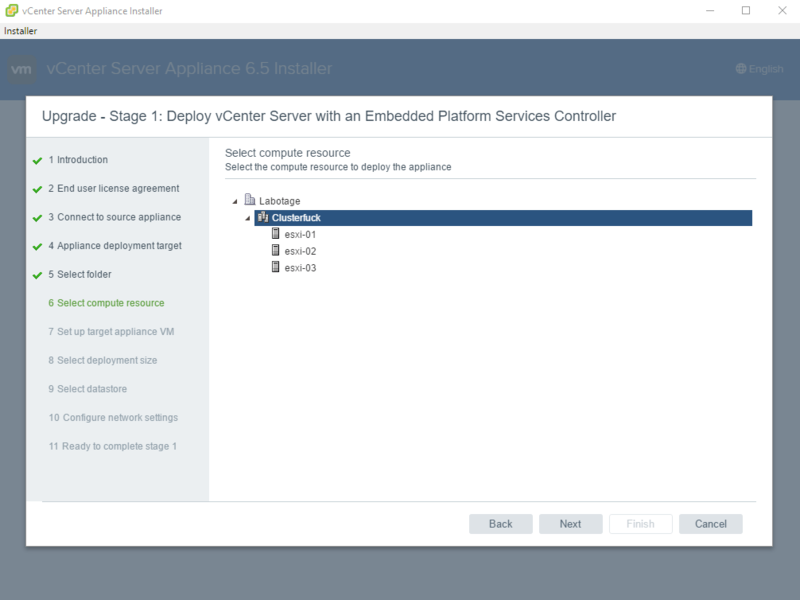 Copy the ‘migration-assistant’ folder to the VUM server and run ‘VMware-Migration-Assistant.exe’, type in the password for the VUM service account and return back to the vCSA 6.5 Installer. 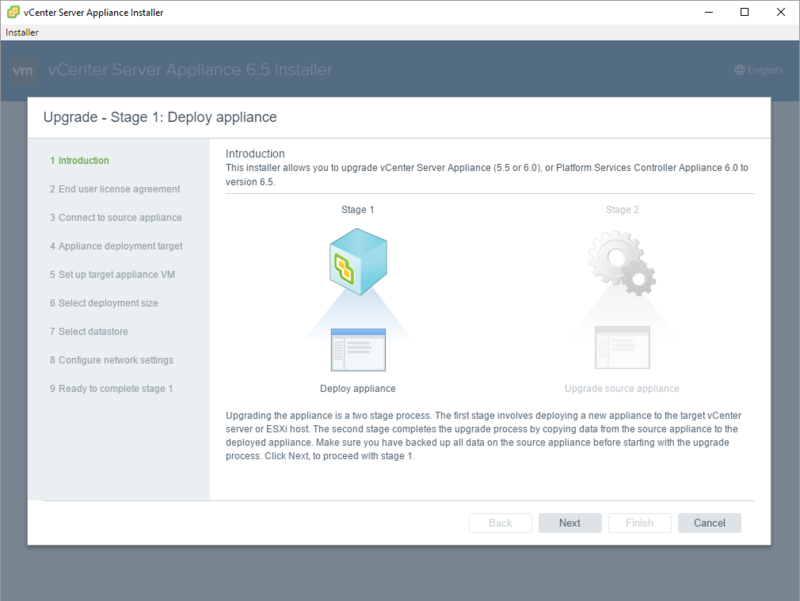 The next few pages are choosing your cluster resources, folder organization, and general deployment information. 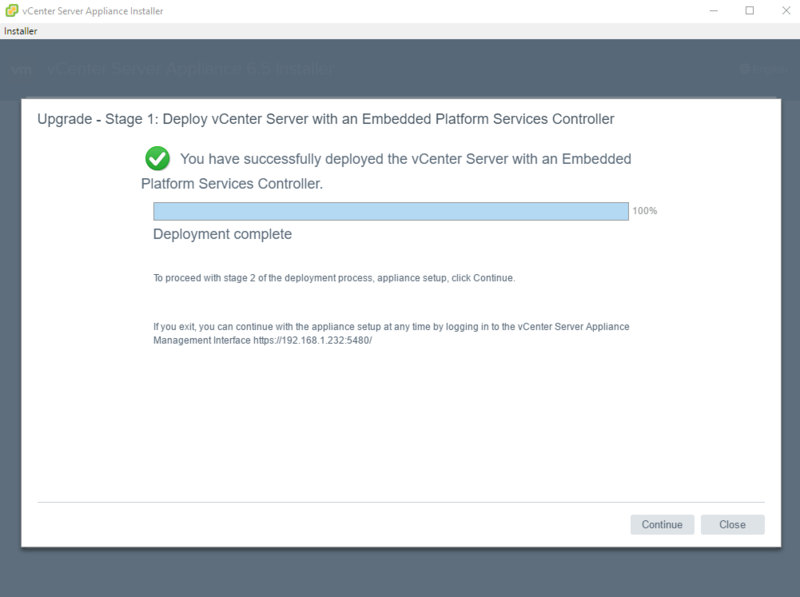 Since this was done in my lab, I chose to stick with the ‘tiny’ vCenter deployment since I do not expect to ever need anything larger than that… hopefully. Once all that is done and dusted, you will get to the confirmation page to verify you didn’t fat finger any settings. If they all look good, click Finish. 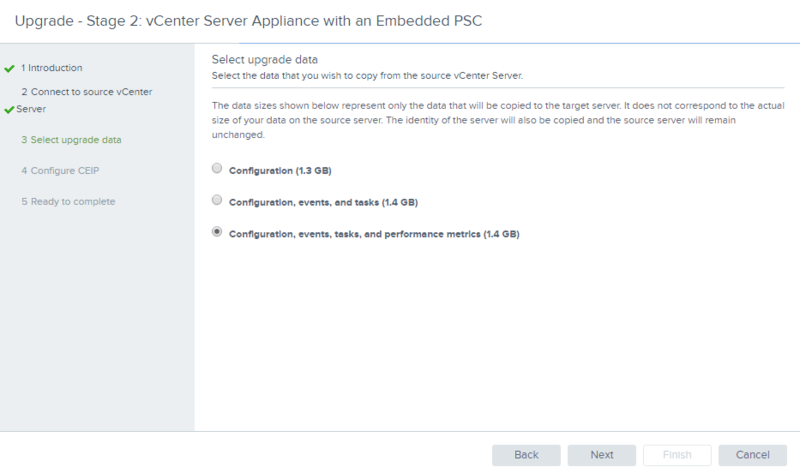 Hit next and fill in your vCSA 6.0 info as well as the host that is running your 6.0 vCSA. 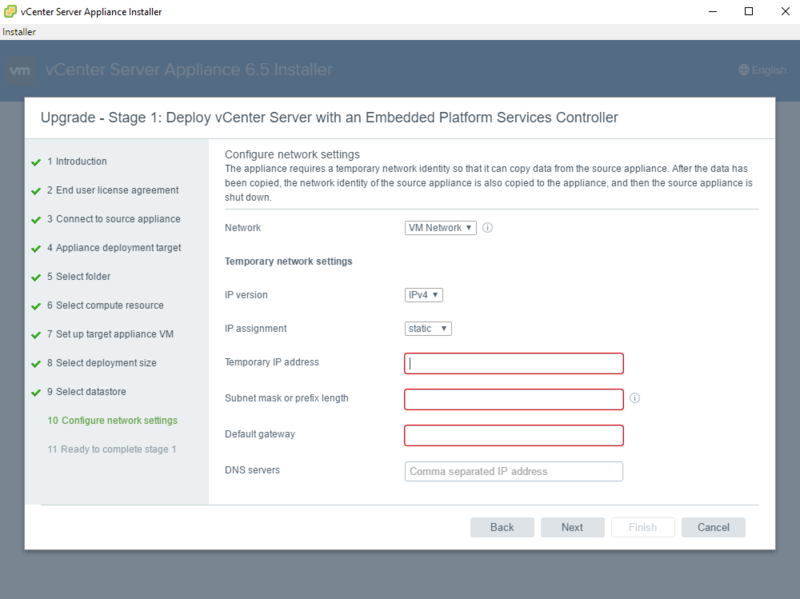 You may get a warning about DRS being enabled on the cluster so feel free to change that setting depending on if your settings are set too aggressively. 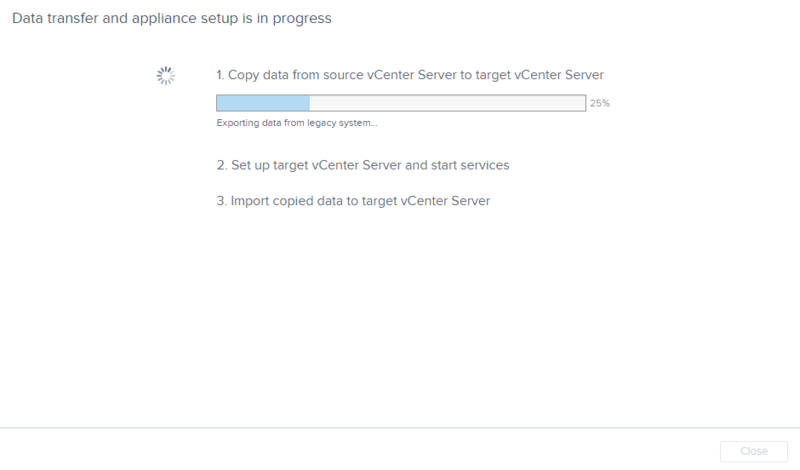 Next you will choose what data you wish to migrate from your old 6.0 to your new 6.5. I wanted all that lovely historical data so I went with the longer, last option. After that, you should be good to go! 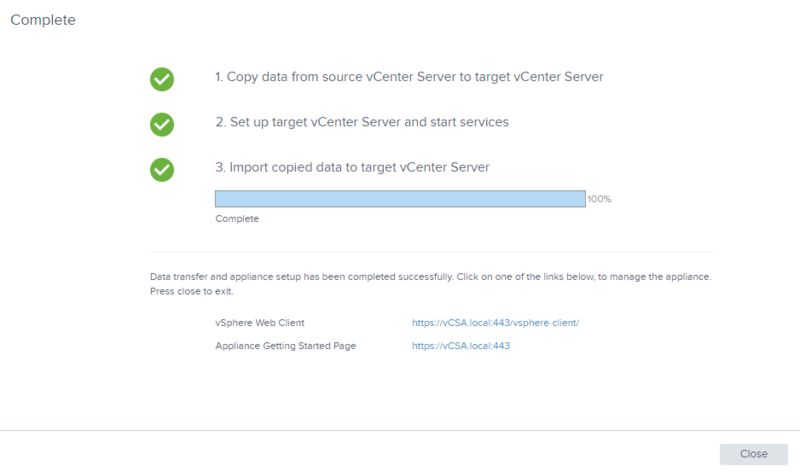 You will see some progress bars and then greeted with links to your shiny, new 6.5 vCSA. 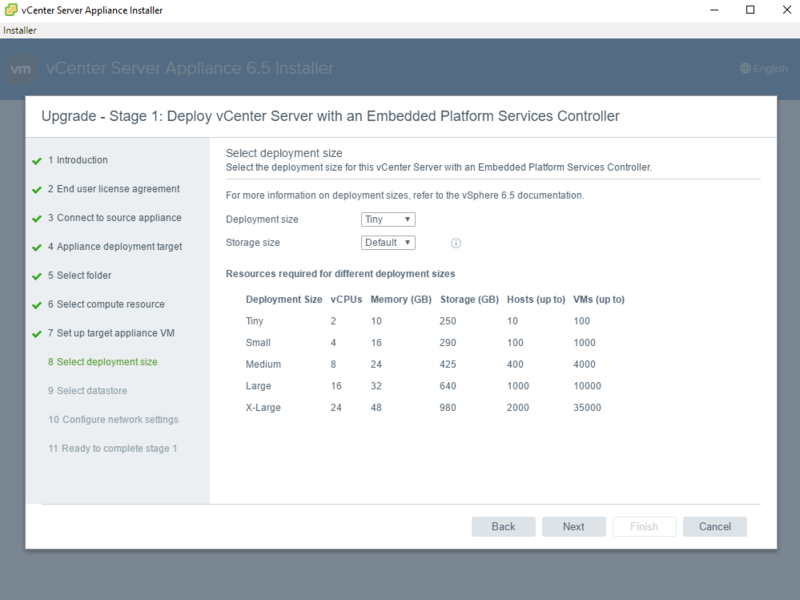 *Hint* It’s the same info as your 6.0, thanks migrations! 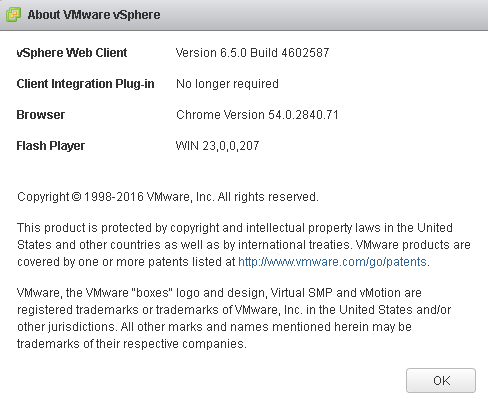 After you login, check out your About vSphere menu and you should see vSphere 6.5 listed as current build. 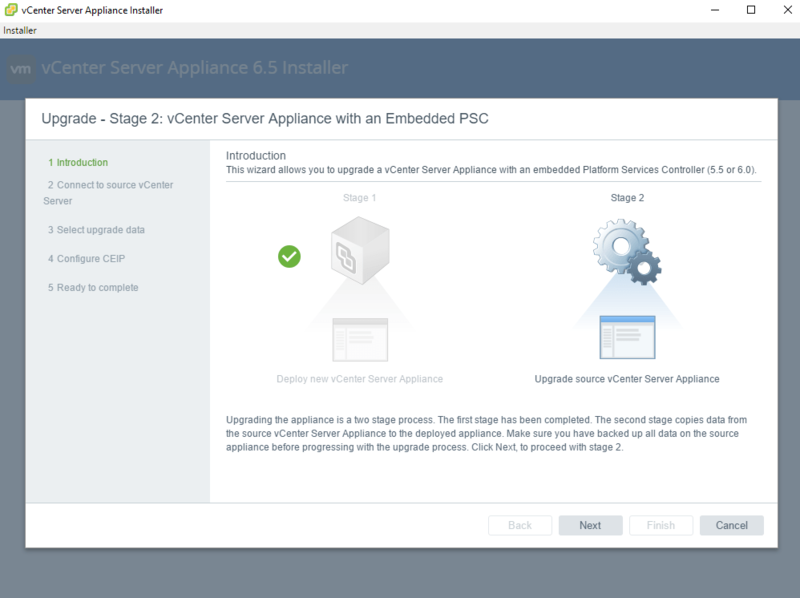 You will also notice that your original 6.0 VM is powered off and can be decommissioned to your liking. 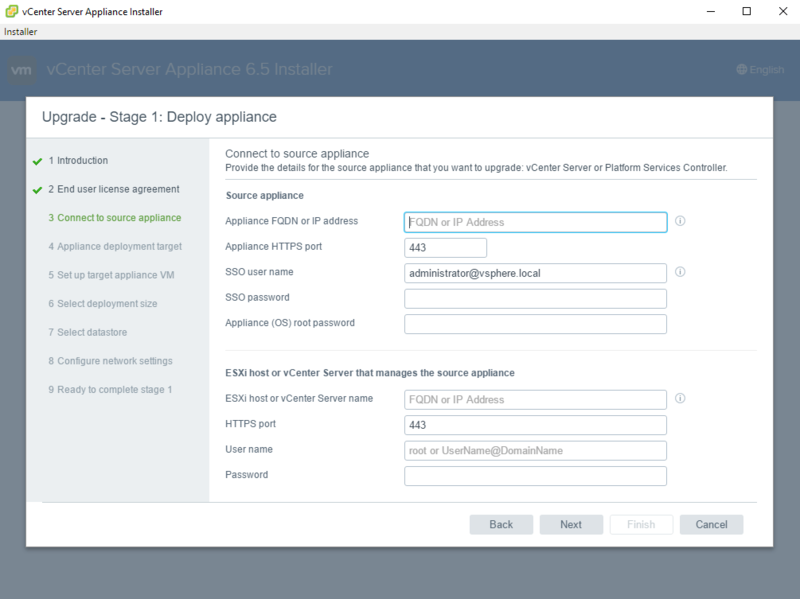 From there, you can hop into the Update Manager tab and upgrade your hosts to 6.5 automatically as well! 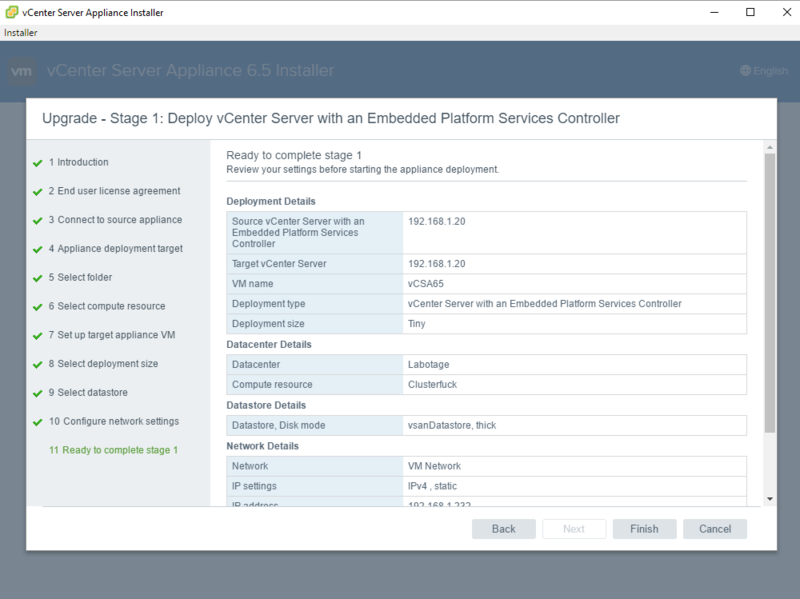 Happy trails, friends and enjoy all the new awesomeness that vCSA 6.5 has dropped into your lap.